Multiplate® ADPtest is a reagent kit used in the research of clopidogrel, prasugrel and other ADP receptor antagonists in platelet aggregation studies for the evaluation of normal platelet function on the Multiplate® Analyzer. Please note the catalog # for Multiplate® ADPtest Kit has changed to 08115761001. You may have previously ordered this product under catalog # MP0220 or 06675794190. 08115761001: Multiplate®ADPtest reagent, Kit, 3 x 1.0 mL. 150 tests. Reagent is lyophilized preparation of adenosine-5’-diphosphate, stock concentration 0.2 mM. 50 tests. Stable until the expiration date printed on the vial label when stored at 2-8°C. 06675689190: Multiplate® ADPtest Aliquot Vials, Box, 100 color coded (green) micro test tubes for aliquotation. MP0120: Multiplate® ADPtest reagent, Bag, 1 x 1.0 mL, 5 color coded (green) micro test tubes for aliquotation. 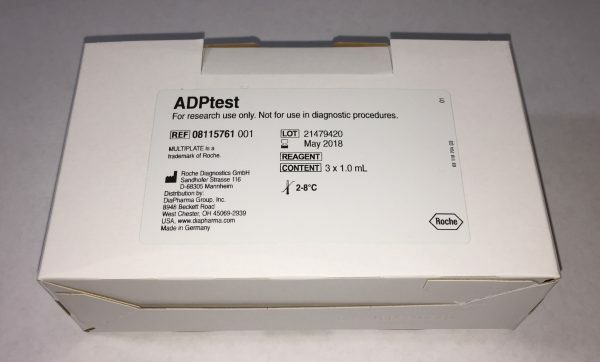 MP0192: Multiplate® ADPtest reagent, Kit, 1 x 1.0 mL. 50 tests. In the ADPtest, platelets are activated by ADP, which triggers several receptors on the platelet surface. Clopidogrel and related drugs block the P2Y12 receptor, which is believed to be the most important receptor for ADP on the platelet surface.